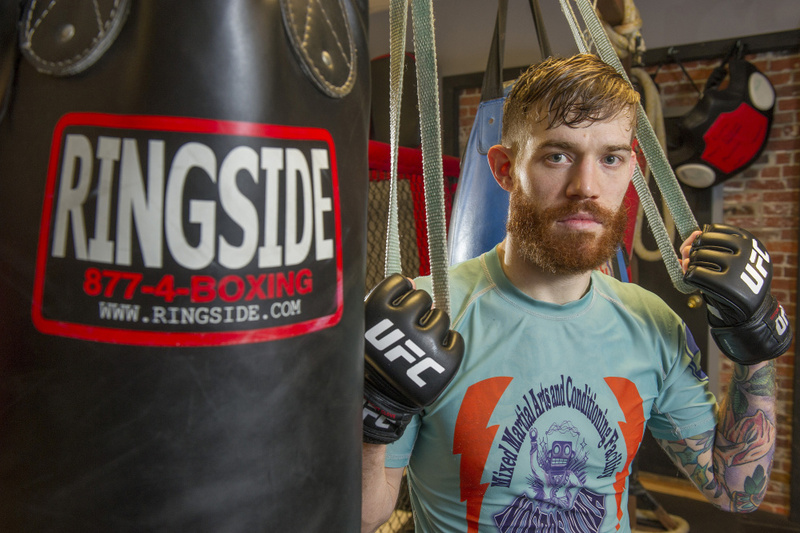 South Berwick native will make his debut in the world's premier mixed martial arts organization on Sunday. One bad break helped lead to Devin Powell’s big break. Powell, 28, has been fighting professionally in the mixed martial arts – a sport that combines techniques of wrestling and boxing with martial arts such as kickboxing, judo and karate – since 2012. Actress Meryl Streep made headlines with her criticism of Donald Trump at last Sunday’s Golden Globes Awards – and her quip about mixed martial arts raised the ire of fight fans. Devin Powell of Wells will make his UFC debut on Sunday. Powell, 28, also owns and operates a mixed martial arts gym in Somersworth, New Hampshire. How does he feel about Streep’s comments? “I think everybody is entitled to their own opinions, but I think martial arts is one of the purest art forms out there and it’s a great thing for kids to get into to help with their confidence, their strength and to expand their talents. The South Berwick native has fought mostly in front of small crowds in northern New England, but on Sunday night he will have his biggest payday yet – more than $20,000 if he wins – for a nationally televised fight in Phoenix. His breaks came in August. On short notice, Powell got a chance to fight in front of Dana White, president of Ultimate Fighting Championship, the world’s premier mixed martial arts organization. White was in Bangor taping his YouTube show, “Dana White: Lookin’ for a Fight.” The premise of the show is that White goes to a small venue to watch a local mixed martial arts fight card. If a fighter impresses enough, he or she can get signed to fight in the UFC. Early in the fight Powell made a positive impression on White and his two co-hosts, Matt Serra and Din Thomas, with his leg kicks and assertive style. Then his opponent, Jon Lemke, caught him with a punch that grotesquely broke Powell’s nose. As the blood flowed freely, Powell wiped it off and came back at Lemke, backing him up with kicks and punches. A Powell uppercut staggered Lemke, and within seconds Powell had applied a rear-naked chokehold for the submission win, causing Serra to jump from his seat shouting profane encouragement. Soon, White and his camera crew were backstage offering Powell his first UFC fight. White liked him as a fighter. Even more, he liked the way Powell fought through adversity. Devin Powell spars with Muay Thai teacher Tim Hagan, one his main training partners, during a recent workout at his Nostos MMA training facility in Somersworth, New Hampshire. Powell, who has an 8-1 record and the 155-pound New England Fights title, makes his UFC debut Sunday night on the undercard at the UFC Fight Night 103 at the 13,000-seat Talking Stick Resort Arena in Phoenix. His opponent is Drakkar Klose, another 28-year-old UFC newcomer with a 6-0-1 record, who trains in Arizona. The three-round fight will be shown live on Fox Sports 1 as one of four preliminary bouts from 8 to 10 p.m. Powell has been told that his fight will be the last of the four, starting about 9:30 p.m.
UFC Fight Night routinely attracts more than 2 million viewers for its weekly shows, held at large arenas across North America. UFC’s best-known fighters, such as Conor McGregor and Ronda Rousey, have reached celebrity status transcending mixed martial arts. 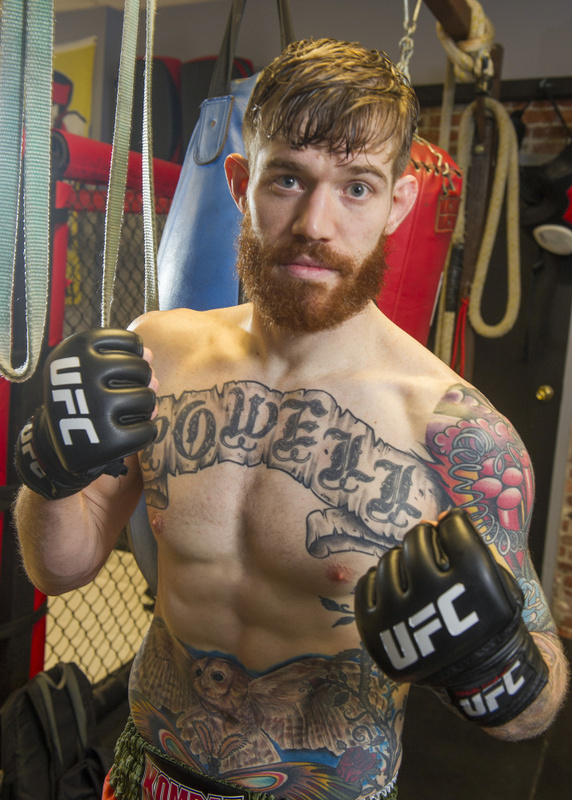 Powell joins a short list of fighters from Maine who have appeared on a UFC card. Retired fighters Marcus Davis of Houlton, Mike Brown of Standish, and former heavyweight champ Tim Sylvia of Ellsworth each had multiple UFC fights. Tim Boetsch of Lincolnville is currently the No. 14 ranked middleweight with a 20-10 record. Boetsch will take a two-match winning streak into his Feb. 11 fight against Jacare Souza at UFC 208. Powell was originally scheduled to fight Jordan Rinaldi, who withdrew before Christmas with an injury. Powell and Klose have vastly different training situations. 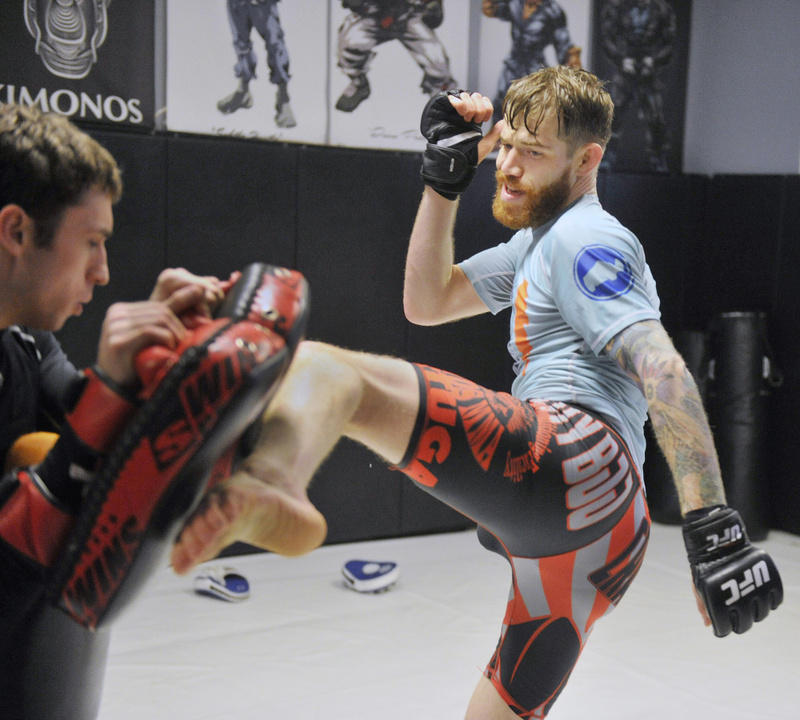 Klose, who hails from South Haven, Michigan, trains at MMA Lab, a large gym based in Glendale, Arizona, that is home to several other UFC fighters. Powell does his training at Nostos MMA, the “family-friendly” gym he’s owned and operated since May 2014. The gym boasts more than 100 students who cut across all age groups. “Ninety percent of the people who train here just want to get in good shape and learn practical self-defense and have a fun, positive place for their families and children to be a part of,” Powell said. The two-room gym is located between a beverage store and a pizza parlor in Somersworth, New Hampshire, just over the state line from South Berwick. One room has a partial cage where Powell focuses his training, at times having to work around rambunctious young children scooting through. Powell has owned and operated the Nostos MMA, a “family-friendly” gym, since May 2014. The gym boasts more than 100 students who cut across all age groups. Here he spars with Muay Thai teacher Tim Hagan. Powell’s training partners include former workout partners at various gyms – guys such as 42-year-old George Law, a BJJ brown belt whose own athletic claim to fame was being part of the Dover, New Hampshire, 1987 Little League World Series team. 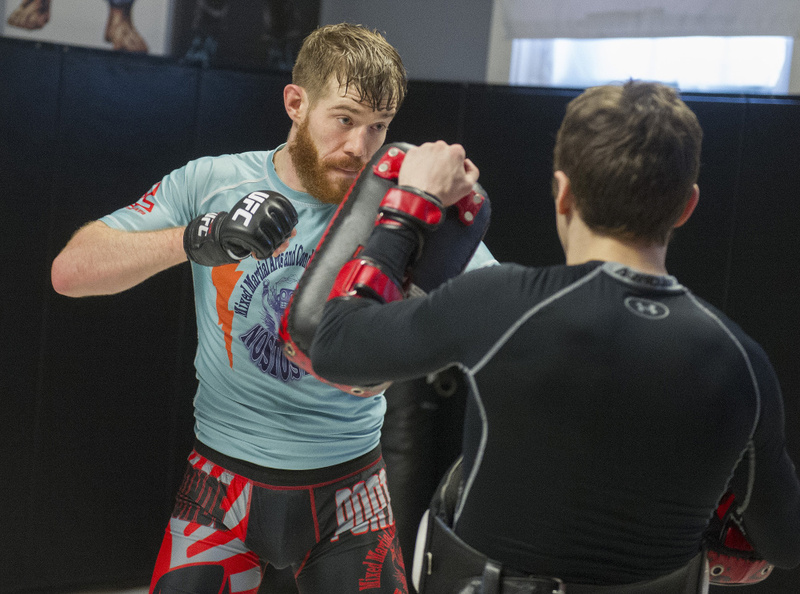 Powell believes his close-knit team, headed by coaches Adam Rivera and Jay Mansfield and cornerman Keegan Hornstra, actually gives him an advantage, even though no one in the group has UFC experience. The name of Powell’s gym has meaning. Nostos is a Greek word, meaning homecoming or homeward journey (think Odysseus returning from the Trojan War). For Powell, Nostos symbolizes breaking out of an unfulfilling job and coming “home” to a new life as a business owner, martial arts instructor and – for at least a few more years – a professional fighter. Powell lives with his fiancée, Carol Linn Hawkins, and his daughter, Clementine, who turns 5 the day after her father’s big fight. It was while doing clerical work at the National Passport Center in Portsmouth, New Hampshire, that Powell realized he needed a positive outlet away from his monotonous job. That’s when he first stepped into an MMA gym. Prior to that, Powell’s lone combat sport experience was as an 8-year-old when he tried wrestling for a couple of days. Deanna (Rix) Betterman, the daughter of longtime Marshwood High wrestling coach Matt Rix, went on to become one of the top female wrestlers in the United States, placing at World Championships and winning gold at the 2010 Pan American Games. But when the once-aspiring guitarist, who graduated from Marshwood High in 2006, came to mixed martial arts as an adult, he quickly became a convert. It was a broken nose that got Devin Powell’s foot in the door. Officials were so taken with his scrappiness amid a fighting injury that he’ll now strut his stuff at UFC Fight Night 103. He lost his first amateur fight, then won three straight and was ranked No. 1 among Northeast 155-pound amateurs when he turned pro in 2012. He won his first fight, then lost his second. Powell was 3-1 when he opened Nostos MMA. His career idled with just one fight over the next 20 months before he went on a four-match win streak between February and August in 2016. He won a decision at a New Hampshire-based Combat Zone show, claimed his New England Fights title with a first-round TKO over Jesse Erickson, in April, and then won a split decision over Tom Marcellino on a World Series of Fighting show at Foxwoods Resort in Connecticut in June, as part of the undercard of an NBC telecast. After the Marcellino fight, Powell was beat up and needed a rest from fighting and active training. His back ached and a foot was injured. When he got the call to fight in front of White, he was left with three weeks to prepare. Not ideal, but an opportunity he had to take. Powell has a non-guaranteed, four-fight contract with the UFC. He’ll earn $10,000 for fighting, plus a $2,500 bonus from Reebok. The winner gets an additional $10,000. Powell’s largest previous payday was at the World Series of Fighting show when he earned $1,500 for the fight, $1,500 for the win and got a small percentage on the 100-plus tickets he sold.